Bijapur also known as Vijapur is a district located in Karnataka, India. It is the district headquarters and a prominent historical place in the state of Karnataka. 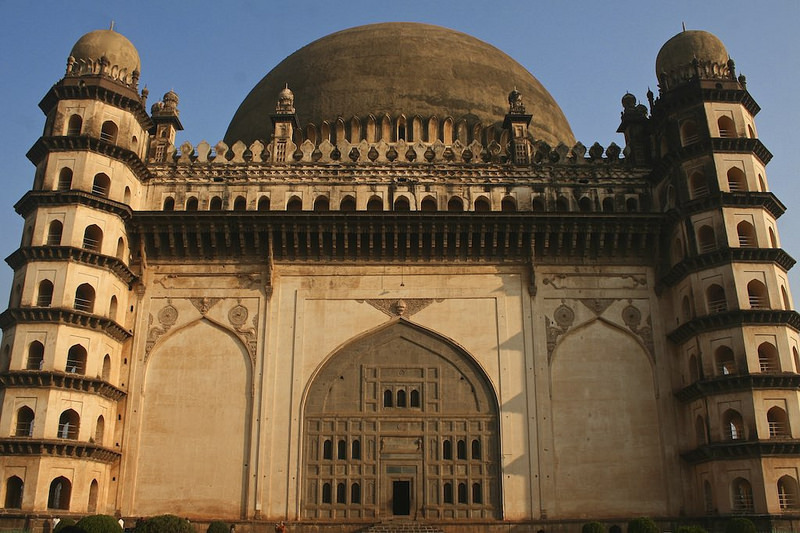 World famous Gol Gumbaz and other historical monuments built during Adil Shahi dynasty is in Bijapur. The city was known as Vijapur (city of victory) when it was founded in 10th or 11th century by the Chalukyas of Kalyani. Bijapur is surrounded by Gulbarga on the east, Bagalkot on the south, Belgaum on the west and Sholapur of Maharashtra on the north. 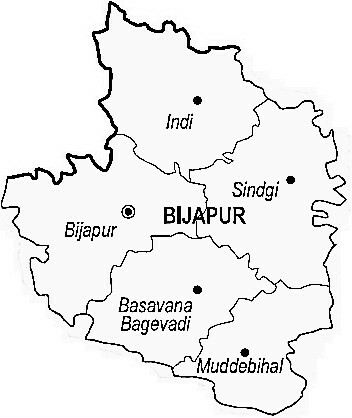 Bijapur is also known as land of rivers. Some of the important rivers that flow in Bijapur include Krishna River, Bhima, Doni and Sina Rivers. Usually during the monsoon season Bhima River overflows and spreads over a large area thus making the land very fertile. A huge Almatti dam has been built over Krishna River. Bijapur has a very interesting history with many dynasties ruling the district for many centuries. The monuments in Bijapur speak about the history that the city faced from different rulers. The history of Bijapur goes back to Palaeolithic age. The archaeological excavation reveals the presence of human settlements during Palaeolithic period. The city was founded by kalyani of Chalukya during 10th or 11th century. After the spilt of Bahamani sultanate in 1518 into five different states, Bijapur came under the control of Adil Shahi dynasty. The Adil Shahi dynasty ruled Bijapur from 1490-1686 and Yusuf Adil Shahi was the founder of independent Bijapur Sultanate. During this period many monuments have been built in Bijapur. Later in the year 1684 Aurangzeb conquered Bijapur from the Adil Shahi dynasty and made Bijapur into a province of Mughal dynasty. Adil Shahi dynasty from 1490 AD to 1686 AD. Climate of Bijapur: The city experience semi arid climate. April and May are the summer months where the temperature rises up to 420c. Summers are very hot and monsoon starts from June to October. The district does not receive heavy rains during monsoon season and winter months are November to January where the minimum temperature hovers around 150c. The best time to visit Bijapur is during October to February when the weather is pleasant. Bijapur has many world famous monuments. Some of the important touristic places are Gol Gumbaz, Jami Masjid, Almatti Dam, Ibrahim Rouza, Malik e Maidan, Upli Buruj,Chini Mahal, Gagan Mahal and Bijapur fort. Bijapur is famous for the world famous monument Gol Gumbaz. Gol Gumbaz is located in Bijapur district of Karnataka, India. It is a mausoleum of King Adil Shahi. The construction was started in the year 1626 and was completed after 30 years in the year 1656. It has a huge circular dome above and it can be said that the name is based on Gola gummatta which means the circular dome. The mausoleum is built in Deccan Indo Islamic architecture using dark grey basalt stone. The mausoleum was built in line with Taj Mahal of Agra. The tomb which is the second largest tomb in the world is maintained by archaeological survey of India. The tomb was designed by Yaqut of Dabul. Gol Gumbaz is well maintained and is surrounded by lush green garden. Construction of the tomb began as soon as Adil Shahi ascended the throne but could not be completed due to his sudden demise in the year 1656. The central dome is the second largest dome in the world and it is standing without any actual support of the pillars. The dome is 44m in diameter and is supported with eight interlocking arches. The entire structure of gol gumbaz is on a 600 feet platform. The walls of the seven storied octagonal tower have staircases inside at all the four corners of the cube. Each story has a arch shaped windows which has been capped with domes. 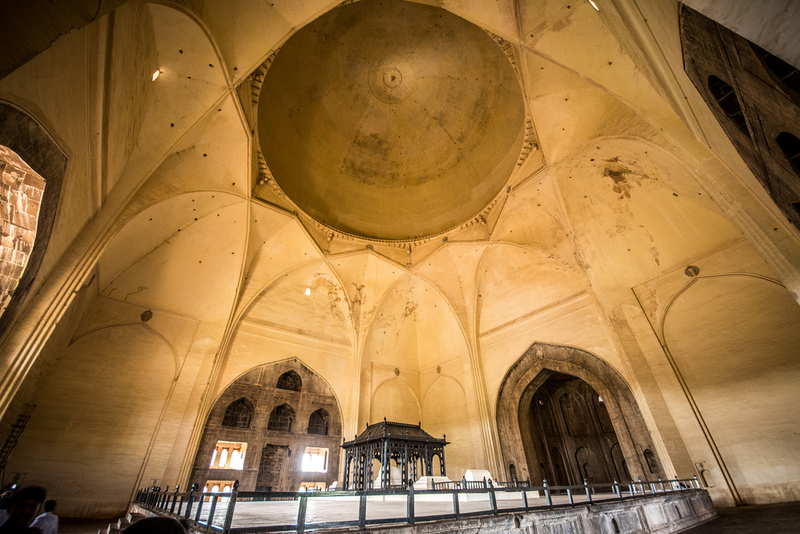 The domes of the Gol Gumbaz are the speciality of the monument. The seventh floor opens to a gallery which is surrounded by a dome. Inside the dome is the acoustic of Whispering gallery which is just amazing. It is called as whispering gallery because even a slightest sound can be heard eleven times on the other side of the mausoleum. Even to this day we can hear the echoes. The graves of Adil Shah, his wives and other family members can be seen inside the building. At the centre of the platform is the cenotaph slab which has the actual grave of Adil Shahi below it. Inscriptions are written at the main entrance which mentions about the date of Adil Shahi’s death. Naqqar khana is a place where music concert were held and the acoustics in Gol Gumbaz allowed the music to reach every corner of the monument. It is now a museum. Gol Gumbaz is open on all days from 10am-5:30pm with a minimal entry fee. Bijapur has many other tourists place other than Bijapur Fort and Gol Gumbaz. Anand Mahal is a two storied building which was constructed by Ibrahim Adil Shah II. Anand Mahal was constructed mainly for music and dance performance. Now Anand Mahal is used by the State for different government offices. It is located to the west of Gagan Mahal. Gagan Mahal was constructed to serve as Royal residence and Durbar Mahal. Ibrahim Rouza: This is another important tourist destination in Bijapur. This historical monument was built by a Persian architect Malik Sandal in the year 1627. It was built in lines of Taj Mahal of India. It has the tombs of Ibrahim Adil Shah II and his queen Taj Sultana. The fine carvings and the graceful minarets around the tomb are the beauty to watch in Ibrahim Rouza. The structure stands on a single rock slab and has a basement which was used to store food and ammunitions. There is also a mosque inside Ibrahim rouza. The windows and the doors are made up of teak wood and the motifs in the windows allow sunlight into the tomb. Another beauty of this historical monument is the garden all around. One can spend good time inside the garden. Tour guides are available to assist the tourist. The visiting hours are from 6am -6pm with a minimal entrance fee. Malik-i- Maidan: It is a huge cannon placed on a top of a tower in Bijapur. It was erected by Ibrahim Adil Shah II after the victory of Adil Shah in the Battle of Talikota in the year 1565 against Vijayanagara Empire. The cannon are one of the largest cannons in the world with a weight of 55tonnes. The metal of the cannon remains cold even during the peak summer period and when hit it gives a resonating sound. The Malik-i- Maidan is open on all days except on public holidays. One can visit the place during day time with a nominal entrance fee. Upli Buruj: It is the famous historical monument built by Hyder Khan around 1584. 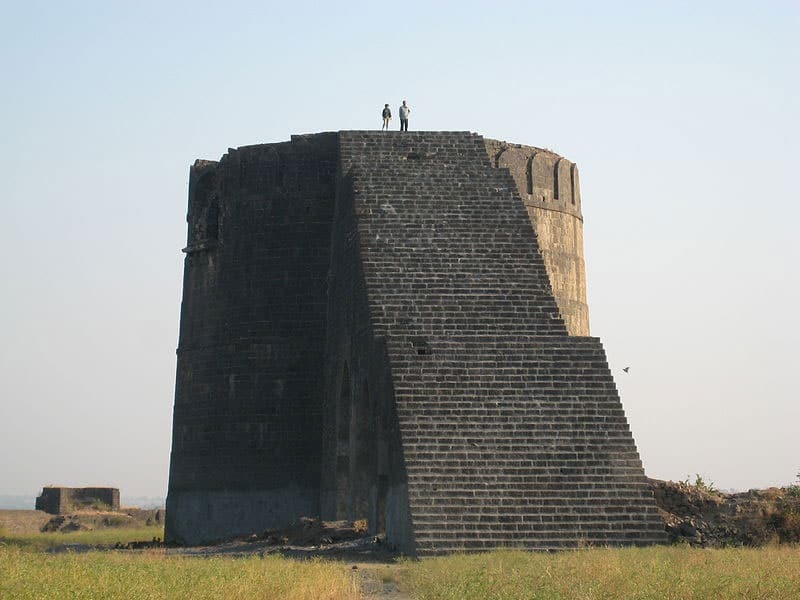 It is a tall watch tower from where soldiers kept a watch on the enemy attack. One can get a look at beautiful view of Bijapur city from the top of the tower. To reach the top one has to climb steep steps in the tower. For the purpose of defence and security two cannon were attached at the top of the Upli Buruj tower. The architectural beauty and the magnificent beauty of the top of the tower makes it a must visit place of Bijapur. Mehtar Mahal: This was constructed in the year 1620 in the indo saracenic style of architecture. It is a three storey monument with intricate designs and beautiful architecture. The Mahal has two delicate minarets which has carvings of birds and swans that are carved in Hindu architectural style. The roof of the Mahal is flat and has a raised minaret above it. Chand Bawdi: It is a step well built by Ali Adil Shah around 1550. It was named after his wife Chand Bibi. This tank was built with a capacity of 20million litres to provide water for the people of Bijapur. A huge compound wall was constructed around the tank for the maintenance of staff. Jamia Masjid: It is also called as Jumma Masjid. The Mosque is located in the south eastern part of the city. The construction of the mosque was started in the year 1565 but was not completed. The entrance depicts nine large arches with five inner arches which encloses 45 compartments. The construction of the masjid is not complete as two minarets are either not built or missing. 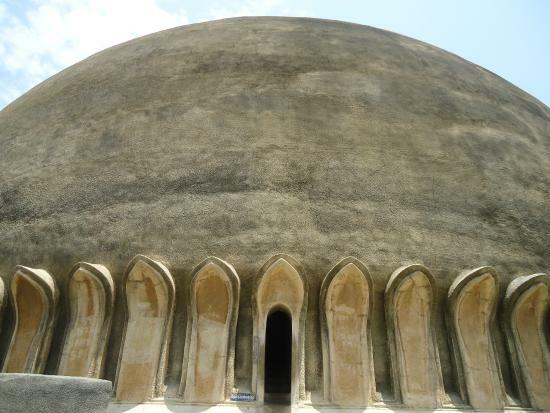 The dome of the mosque is in semi circular shape. Mohammed Adil Shahi built mehrabs in the mosque with Persian inscription in the year 1636. Later Aurangzeb extended with eastern gate, verandahs to the east, south and north. Another interesting feature of the mosque is it has 2250 tiles that are laid in the form of a prayer mat in the prayer hall. Bijapur does not have an airport and the nearest airport is Belgaum which is around 200kms. Bijapur is well connected through road from different parts of India. One can reach Bangalore and then travel by bus. It also has good train facilities. Distance between Bijapur and Bangalore is around 530 km. from Hubli it is 200kms, from Belgaum it is 217kms, from Gulbarga it is 145 Kms, from Bidar it is 270 Kms.